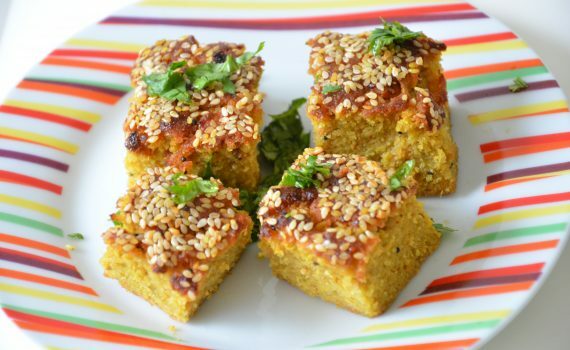 Handvo is a traditional Gujarati savory cake. 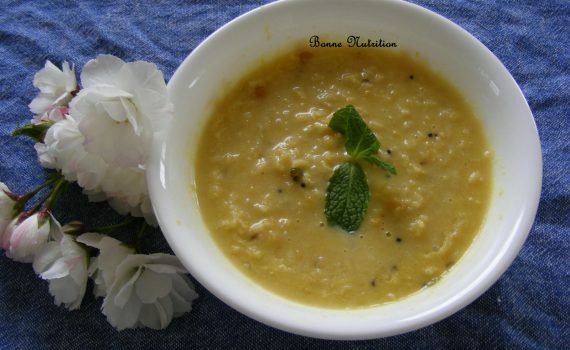 It is made with a combinations of lentils, rice and buttermilk and vegetable. It can be steamed or baked. 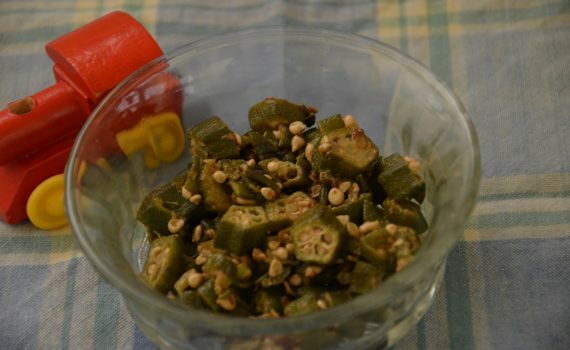 It’s makes a great snack or even breakfast option. Wash the rice and dals/lentils and soak in water for 4-6 hours. Drain the water and blend soaked rice, yogurt, lentil, ginger, green chili to a slightly coarse texture with as little water as possible. Add turmeric, salt, sugar and asafoetida, blend it again for 2-3 seconds. Transfer the blended mix into a bowl and let the mix ferment overnight. In the morning, add the bottle gourd/lauki or zucchini, 2 tablespoons of oil, lemon juice to the fermented dal mixture and mix well. Add ENO to the mixture and mix again. Grease a baking pan and pour the handvo mix into the greased pan. Tap the pan to help spread the mix evenly. In the meanwhile prepare tadka (seasoning)-heat a tablespoon of oil in a small wok or small pan, add the mustard seeds. When mustard seeds start popping, tear the curry leaves and add to the sesoning along with the asafoetida/hing. Turn off the stove and put the wok on side and let the tadka cool a little. Then add the sesame seeds to it. Pour the seasoning/tadka over the handvo batter. Cover the pan with aluminum foil and place the pan on middle oven rack and bake at 350 F (or 180C) for 20mins. Remove the foil and bake for another 20 minutes (top of the handvo should turn a light golden brown) and test with a knife inserted in center of the cake. If it comes out clean, your handvo is ready. Let the handvo cool down a bit. 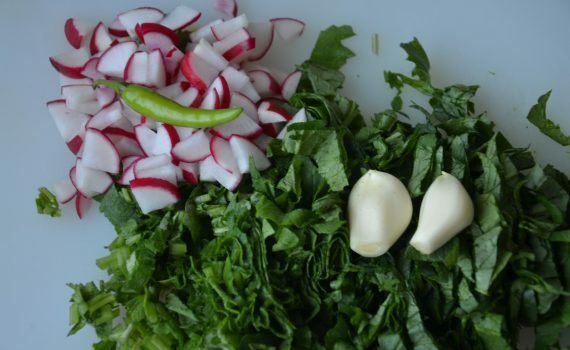 Cut into pieces, garnish with cilantro( and serve with chutney. 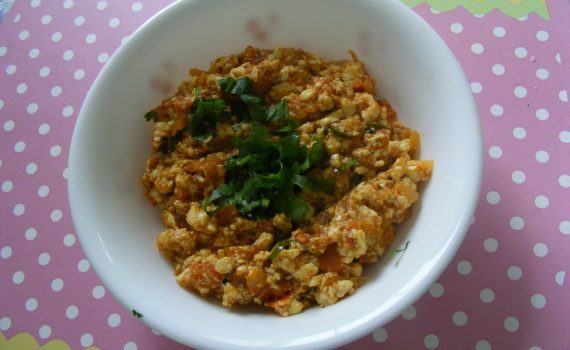 Another steamed dish that can be had for breakfast or as a snack-tastes great with some spicy chutney. Mix the besan well with the yogurt,salt and about a cup of water making sure that there are no lumps. Let it ferment for about 1-2 hours. Then add the ginger+chili paste, turmeric, lemon juice and mix well. Add water to the steamer and let it boil. When it is ready, add the fruit salt/soda bicarbonate to the batter and mix well. Grease a pan/thali (you could even put the batter into idli moulds) and pour the batter into it. Once they are ready-pour the tempering (heat the oil, add the mustard seeds, when it starts to pop, add the sesame seeds, green chili(optional) over the dhokla. 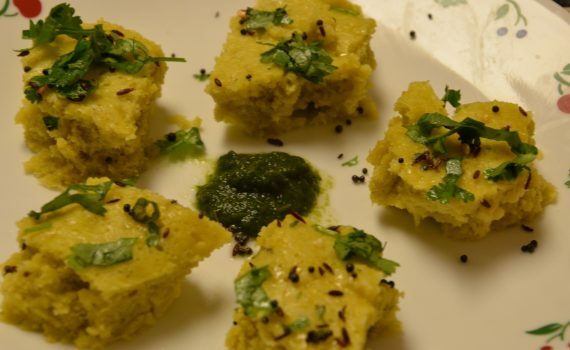 Garnish the dhokla with chopped coriander leaves and grated coconut. Cut and serve with spicy mint and coriander chutney. 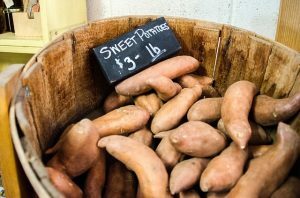 There are different varieties of sweet potatoes available: purple and orange coloured. The purple colour is due to a pigment called anthocyanins and the orange-colored sweet potatoes owe their colour to beta-carotenes which gets converted to Vitamin A in the body. The best way to get the health benefits of these are by either steaming or baking them. 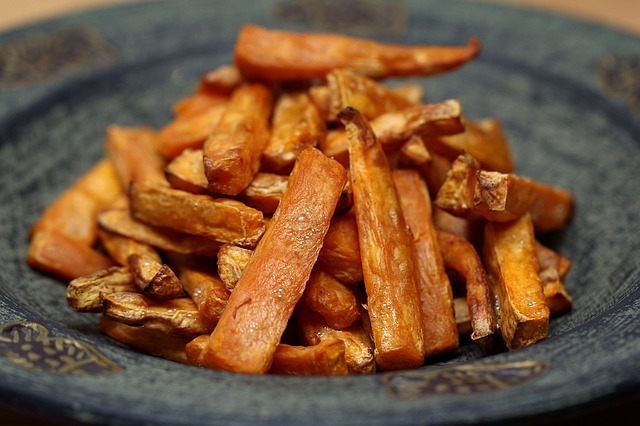 If you like fries and sweet potatoes-here’s a healthy snack that look like fries but are actually baked. Kids will love the sweet taste of the sweet potatoes while adults can sprinkle it with a little chili powder for that extra kick! Put all the ingredients into a mixing bowl and toss till the sweet potatoes are coated. Spread out onto a baking tray in a single layer. Bake till they turn golden (about 30-40 minutes). Serve as a snack or as a side with your meals. You don’t have to scrape the sweet potatoes if you scrub them well with a brush. Sweet Potatoes can be substituted with other root vegetables like beetroot, carrots, parsnip or turnips. You can experiment with spices & herbs like garlic powder, cumin powder,rosemary, Italian seasoning, etc. 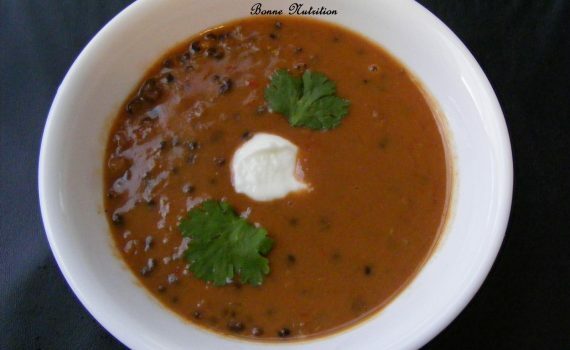 Nothing beats eating dal makhani (with the oodles of butter and cream) with hot rice or chapathis or even naan. We always ate it in restaurants as I had no clue how to make it.I had to try out an alternative way which didn’t have so much butter or cream so that we could enjoy it regularly instead of eating it once in a way. The “better-half” warned that if it doesn’t taste like the restaurant stuff,he wasn’t going to touch it(so much for a supportive husband! ).Anyway,I substituted the cream and butter with low-fat milk . 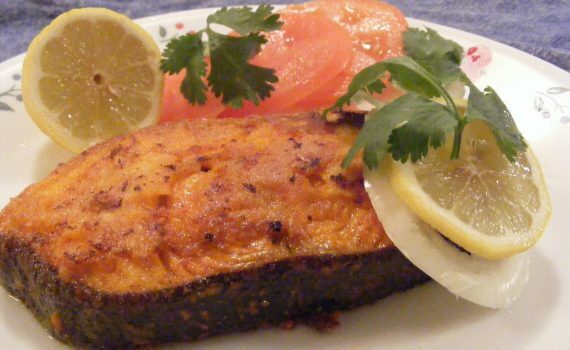 I must warn you here-it takes me a good 2 hours to make this dish,but it’s worth the effort every time.Suffice to say that it was eaten by the fussy hubby and it’s been added to his list of dishes that turns out well even without the extra fat! Discard the water used for soaking the beans/dal overnight. Put 6 cups of water into a pressure cooker and add Urad,split gram(or red beans),chopped onion,garlic.Cook till one whistle then let it cook on a low flame for about half an hour. ( If you don’t have a pressure cooker,cook in a closed saucepan for at least 40-45 minutes). After half an hour,switch off and let the pressure drop.Then,open and add the tomato puree and the slit green chilies.Cook, stirring occasionally for 20 mins on reduced flame. Add the milk and cook for 8-10 mins. Add the red chilly powder,sugar(optional) and salt. Let it cook on low flame for a further 5-6 minutes, stirring occasionally. Garnish with chopped cilantro/coriander leaves and whipped curd. 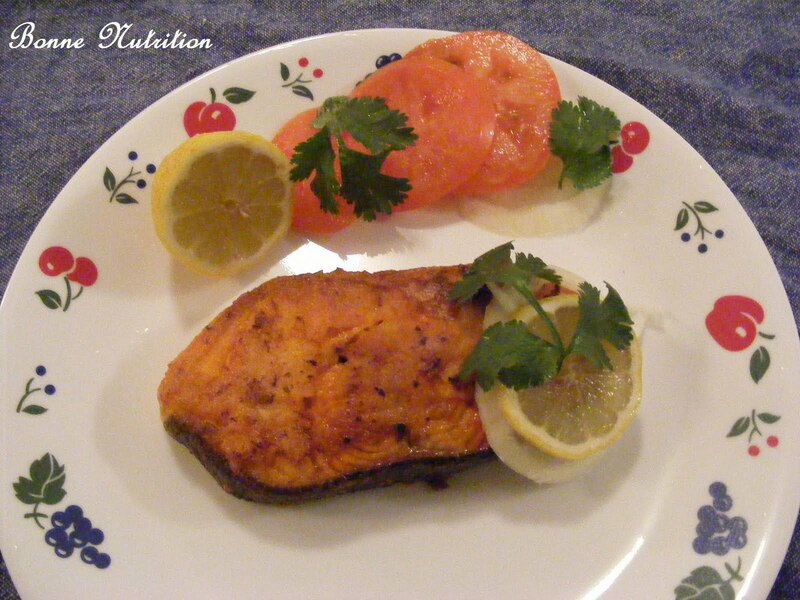 Question:Which is your favourite high-cal dish that you would love to have in a low-cal version? Ragi (English-Finger millet,Chinese-䅟子,Arabic- Tailabon, German-Fingerhirse, French-coracan) is a popular millet in Southern India and is made into different dishes like porridges, puddings, pancakes,cookies, etc. Nutritionally,it is rich in the amino acid methionine and is among the few grains which contains a considerable amount of calcium. Ragi is also given to babies as one of first cereals after rice.My grandmother used to make ragi manni during summer, as it is believed in Ayurveda to cool the body.Traditionally it is made by soaking the ragi millet overnight in water,then grinding it to a fine paste and straining it in a cheesecloth.This is then cooked with jaggery and coconut milk,till it reaches a thick pasty consistency.It is then poured into huge plates and set aside to cool. The end product used to be simply amazing-a dark chocolate brown pudding(my gran used to tell me that it was Indian chocolate pudding,so that she could get me to eat it)that simply melted in the mouth. Sadly,I could not find ragi millet here(not that I would have gone through the whole cumbersome process even if I had),but managed to get the ragi flour at the Indian store to make this instant version. I substituted milk for the coconut milk and the final product still was very tasty though it didn’t have the same rich dark brown colour.Also,since it’s not strained you can see brown specks of the ragi coat. The ragi manni/pudding can be eaten hot or cold(I love it cold)and had as a porridge for breakfast or served as a dessert or a healthy snack(if you can mange to control the portion size) for kids. Mix the ragi flour with the cold milk and make sure there are no lumps. Pour this into a saucepan and add the jaggery/sugar,salt and cardamom powder. Cook on medium heat stirring continuously(take care to see that it doesn’t form lumps). When the mixture starts to thicken, reduce the heat and keep stirring till you get a porridge like consistency. 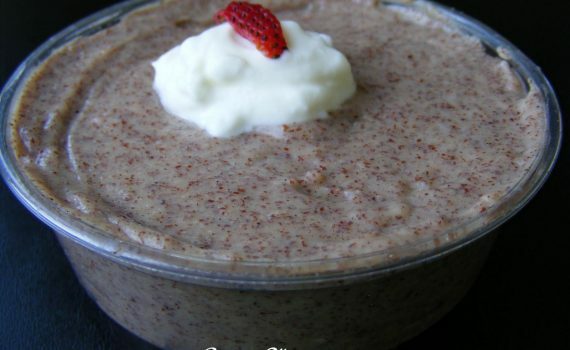 Serve the ragi manni (finger millet pudding) warm or chilled. You can substitute sugar for the jaggery, though it is more nutritious to use jaggery. Adding a pinch of salt is supposed to make the dish sweeter (not sure if that’s really true). Question: Do you feel that adding a pinch of salt to a sweet dish makes it sweeter or is it just an old wives tale? Wash and chop the radish and greens. Heat the oil in a pan ,add garlic,sauté for a minute and add turmeric powder. Add the chopped radish .Let it cook for a couple of minutes . Add the leaves and mix it well. Sprinkle salt as per taste. Cook covered for 5 mins. 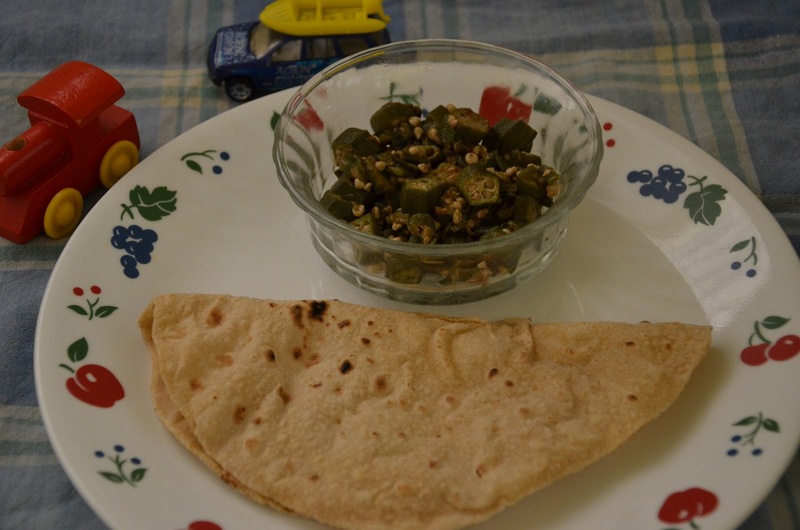 Serve the ‘mooli ki sabzi’ hot with roti. This also goes well with rice and moong dal. Soya or Soy is originally from East Asia, but has recently gained popularity all over the world ever since it’s health benefits were discovered. Recently though, it has been getting some negative reports,but I personally feel that soy in moderation is fine. The protein in soy is complete(equal to meat) and hence is better than other beans and legumes. There are many products that are made from soy,like soy flour,roasted soy nuts,soy milk, tofu,soy nuggets,etc. This recipe is from Ms.Meghana Ghatpande(my friend Rohini’s mom and Meghana aunty to the rest of us). Tofu is just like paneer to see and taste, but more nutritious and healthier as it’s a plant product and made by coagulating soy milk. 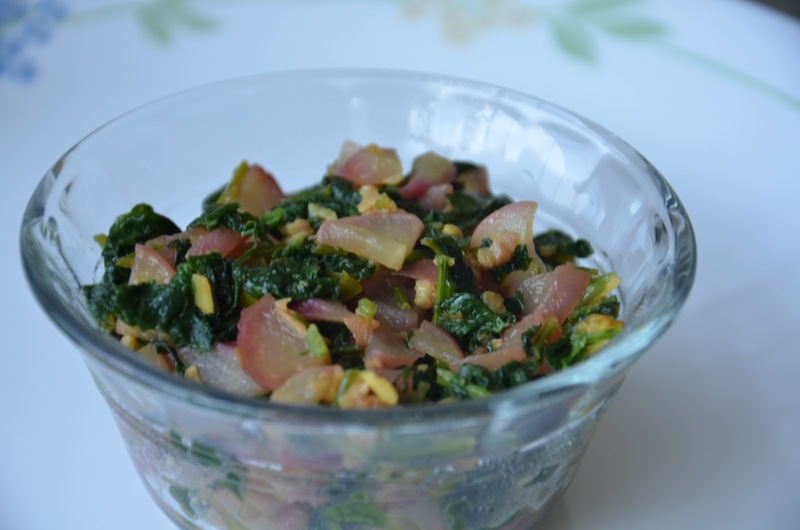 This makes a good side dish with phulkas and can also be used as a filling inside a sandwich/wrap. It’s basically a protein packed dish,and the mustard,cumin and coriander make this dish oh-so Indian!! Heat the oil in a non-stick kadai/pan. When it starts to crackle and pop,add the sliced onions,salt and saute till it becomes translucent. Add the turmeric, cumin powder,slit green chilli,tomato pieces and saute till it gets cooked. Add the tofu,stir for a couple of minutes. *While buying the tofu for this dish,pick up the firm tofu if possible(as the silken/soft tofu are more suited for making dips).